The Taranis Plus Open TX 2.2.2 User Manual is intended be a hands on, in the field or in the shop reference guide. It is Spiral bound so it does not spring closed and lose your page when you set it down, and all 76 pages are printed on heavy, gloss printing stock. Author, Lothar Thole has done an excellent job presenting the Taranis Plus and OpenTX in a comprehensive and concise format, rich with graphics and diagrams, the Taranis Plus User Manual is exactly what so many of us have been waiting for. While we are all grateful for the plethora of information available online dedicated to the learning and use of OpenTX and the Taranis; having a printed manual that you can sit with on the couch or take along to the flying field makes learning and using the Taranis that much more enjoyable. 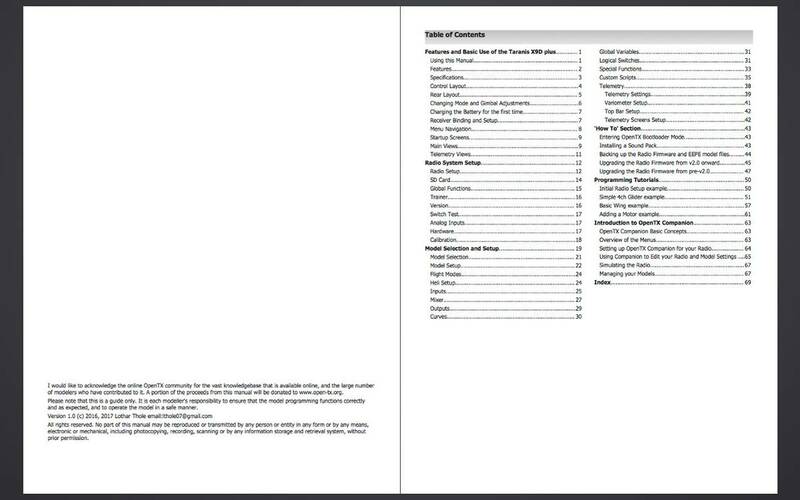 The Layout of the manual is designed to introduce you to the basic features and control layouts of the Taranis and then progressively teach you how to navigate to and through, the various menu fields. Once familiar with navigation you go on to the real meat and potatoes of the OpenTX system. The author spends time with you, going over the details of every control and function and then presents you with examples that you can try on your own. 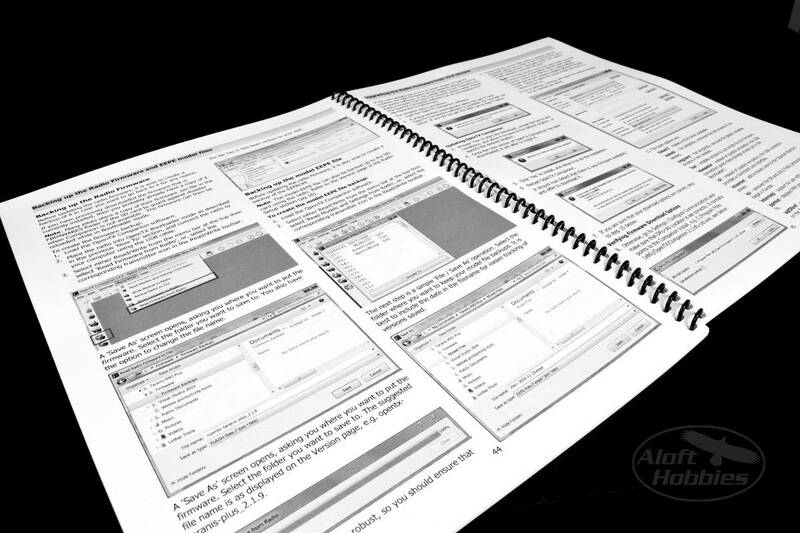 In the later chapters you are given hands-on programming tutorials to learn and practice with. For the RC enthusiast who wants to take the flexibility of OpenTX to the next level, there is a chapter on learning to create custom functions for the Taranis using LUA script. In the LUA script chapter you will be introduced to how LUA script functions and be presented with example programs you can work with. Whether you want to become an OpenTX power user or would just like to have a reference manual in the field, the Taranis Plus User Manual is worth its weight in gold. This manual needs all of our help to survive. 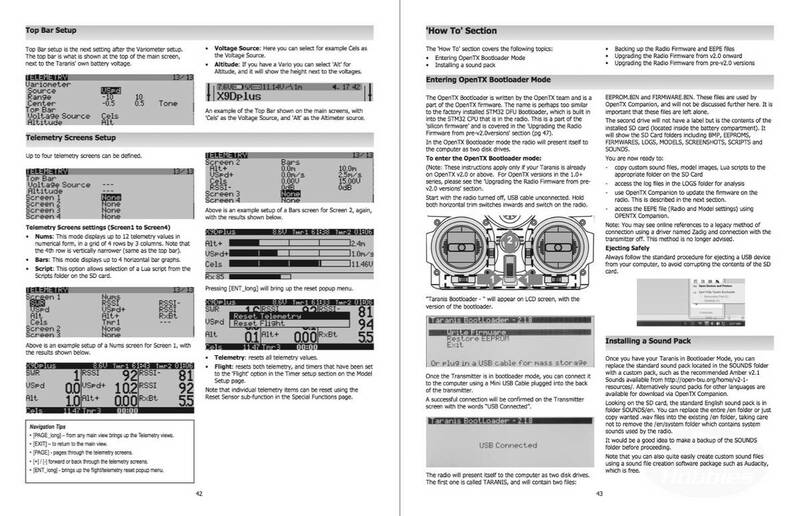 As OpenTX and the Taranis continue to evolve, this manual will be periodically updated and re-released, so it remains a viable tool within the RC community. Please, do not copy, reproduce or in any way release the information contained within.